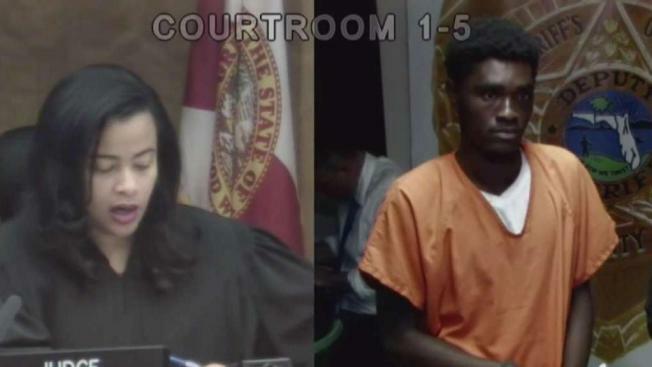 Johnson Joseph is accused of breaking into a home in North Miami Beach and robbing the place -- but before he left, he kissed the victim on the cheek. A South Florida man was arrested after breaking into and stealing from an elderly woman's North Miami Beach home and then kissing her on the cheek while on his way out, police said. Johnson Joseph, 24, of North Miami, faces charges of home invasion robbery, armed grand theft, theft from an elderly person and fraudulent use of a credit card, according to an arrest report. Joseph entered through an unlocked door of the victim's home on Sunday and repeatedly told her, "I need money," the report said. When the woman said she didn't have any, Joseph ransacked a bedroom and stole two credit cards, a debit card and $300 cash. The victim tried to yell for her son for help, but Joseph pulled out a knife to keep her quiet. He took her iPhone and kissed her on the cheek before fleeing, the report said. Afterward, Joseph allegedly charged over $350 on the victim's credit card. He was later tracked by the victim's phone and was apprehended in the area of NE 160th Street and NE 13th Avenue, police said. Joseph is being held in jail without bond on the grand theft charge, online jail records show. Attorney information was not available.